Compact and convenient the 24L kitchen cupboard bin is a motion activated sensor bin and ideal for the Small kitchen, bathroom and home office. The touchless lid helps reduce cross-contamination whilst adding style to your home. The 24L stainless steel bins fits neatly under your desk, in a kitchen cupboard or standing alone, it incorporates an ultra modern bag-less design so there's no unsightly bag liner overhang. The 24litre kitchen cupboard bin is an incredibly versatile waste disposal option. While the size and shape make it ideal for smaller kitchens, cupboards and the bathroom, the stylish good looks and brushed steel finish make it suitable for any room at home or beyond. Perfect for reception areas and ideally suited to the workplace, the uniquely innovative design of this bin makes it a clear-cut top choice for a range of settings. So what makes the 24litre such a fantastic product? Initially, it is the sensor technology that sets this bin out from other brands. 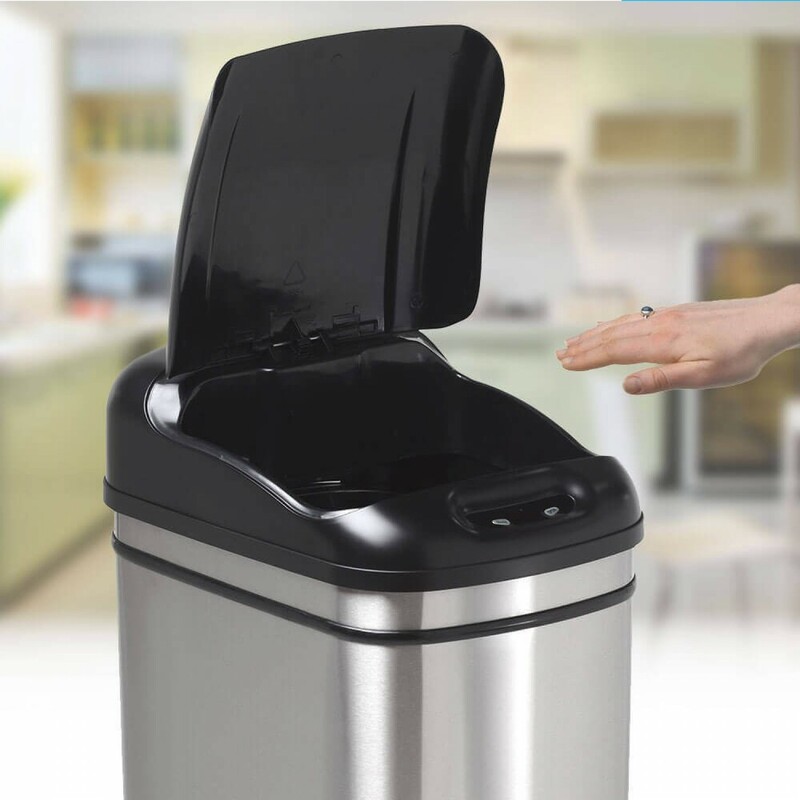 An advanced infra-red sensor detects the movement of your hand and the bin opens instantly, taking less than 0.5 seconds to open for you to place the waste inside. You keep your hands free, and you keep them and the bin cleaner thanks to the touch-less technology. If you want the bin to stay open for more waste you can press a button and it will stay open until you press it again to close it, but if not, it will simply close on its own. The lid fits tightly, keeping all waste inside where it belongs, and thanks to our recently developed Silenx technology, it is quiet to use. The hygiene implications here are obvious, but there is more. A unique bag-retaining ring that secures the bin lining bag and stops it from slipping or sliding or sagging means that you can rest assured there will be no spillages inside. The ring safely and neatly tucks away all signs of the bag so get a clean, streamlined look – it literally looks as clean as it is. The materials it is made of back up the hygiene promise – easy to clean, dirt resistant and even fingerprint-resisting; this is a bin that stays clean inside and out. It is ideal for busy households and workplaces where hygiene is important. Made from premium grade stainless steel and given a high quality brushed finish, our stainless steel bins are designed not only to last, but to look good for as long as possible. The easy-to-clean, stylish surface is matched by an aesthetically pleasing design that will look great in any setting. 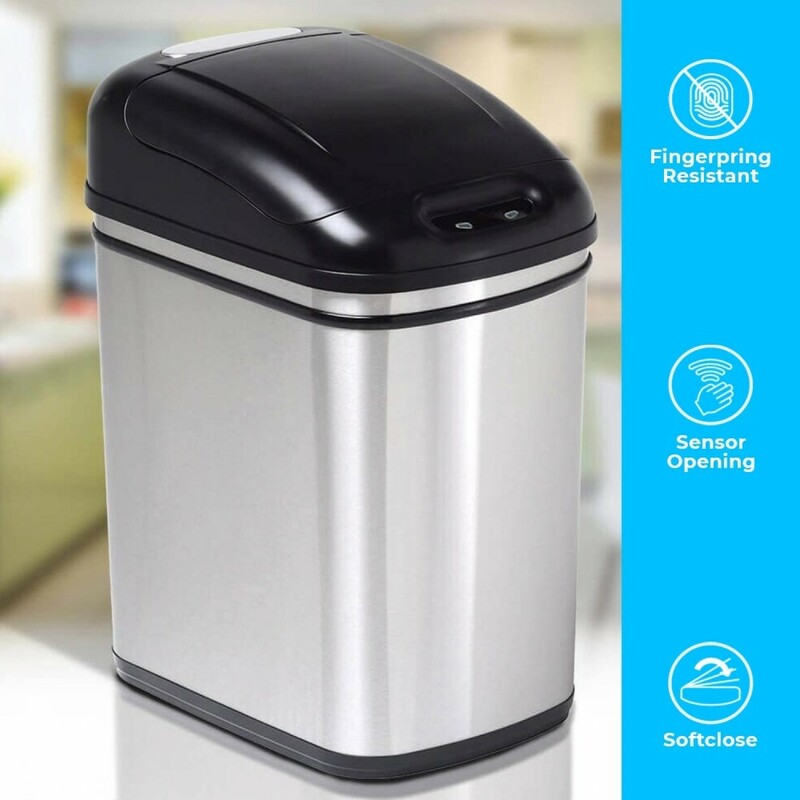 Whether you have a modern office space that requires modern solutions to waste management, or a traditional family home that is too busy to deal with ineffective dustbins that create mess, the 24L sensor bin can work for you. For other applications, a larger or smaller bin might be a better choice – check out the range of larger bins from the 80L Maxi, 60L, 50L and 32L larger versions to the smaller 8L and ladybird countertop examples. Forget swing-top bins that collect dirt and residue on their squeaky lids, pedal bins that grow weaker and less efficient with time and plastic bins that look cheap. Our kitchen cupboard bin comes at a market-leading price with a 10 year warranty to protect your purchase, saving you time and money and offering you a hygienic and stylish waste management option. Bag retaining ring included – Allows the use of any bin liner.